It was a simple question to which I gave a simple answer. For Christmas each year, we drive around looking at Christmas lights in our pajamas with hot cocoa. But in the days that followed, I wrestled with my limited answer. In reality, the frustration of trying to recreate traditions wherever the Armysends us has caused us to give up on many of the ones my husband and I grew up with. During some assignments, for example, being too far away made it impossible to be with family during any holiday — so we were on our own, blending our traditions with those of other military families. We’re in the middle of a permanent change of station this year, and I have been sad to realize that I have become apathetic. This is our third PCS in a row over the holidays. After a while, mustering the energy to pull off an amazing Christmas experience while exhausted is just more exhausting. And it’s not just Christmas. Winning “Mom of the Year” is impossible when your child is the new kid at school and you feel the pressure to top last year’s Pinterest-inspired party. One year over a deployed Easter, my young children fought dressing up, going to church and egg hunting. I had a near breakdown trying to make Easter feel like “Easter.” My attempts to make up for the lack of traditional elements seemed only to make everyone miserable and me a lot less fun to be around. And, of course, that paled in comparison to my husband’s experience of the holiday overseas. So it’s no wonder I didn’t have a better answer to my friend’s simple question. I realize now that some of my motivation to have and keep traditions has been more about overcompensating for the guilt that I can’t offer all the traditions my husband and I grew up with. Rather than asking what activities would bring meaning and togetherness to our little family in the moment, I have been caught up in someone else’s definition. So what can I do about that? And what can you do about your traditions — or lack thereof? My “aha” moment was the realization that my husband and I needed to be more intentional at creating the traditions that make sense for our military family — a task that takes communication. Over the years of trying to fit in traditions, Matt and I have not actually discussed what traditions are most important to each of us. 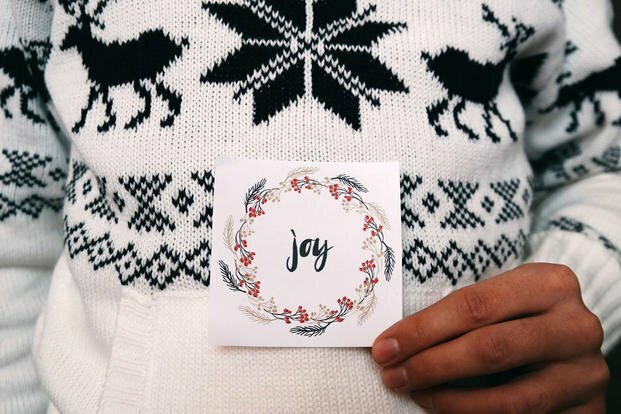 We have not talked about what makes Christmas feel like Christmas, what activities make us feel most together or bring us the most meaning, or what activities we want to be more intentional about doing regularly and which ones are only adding more stress. Tradition finds its roots in upbringing and culture. Matt and I learned this quickly during our first marital conflict 18 years ago over whether banana pudding should be served cold or hot. His parents, born and raised in the south, served it no other way than warm. Mine, raised in the midwest, served it cold. Of course, we both brought those beliefs into the marriage with us. As silly as that sounds, all of us bring beliefs and ideas of what defines “family,” as well as the activities that symbolize togetherness and meaning. Trying to form one definition in marriage when there are deep emotions attached is challenging for any couple. The military lifestyle can make it even more difficult to let go of or make changes to traditions that shake your beliefs and values — like my attempt to force Easter tradition during a very challenging time for our young family. Freedom for me, and relief for Matt, is learning that tradition motivated by “I have to” is more of a prison than a celebration for all of us. It is an over-ritualization that takes away more than it gives. Smaller traditions I have not thought of in years are beginning to stand out as more valuable, emotional and sentimental than ever — such as large Sunday meals together (known as “supper” in the south). These are the reminders that not all traditions we grow up with should be forgotten. Instead, they can be enjoyed even more when we get to be a part of them. And some are quite doable and realistic, which makes them even more endearing when military life can throw you curveballs. I had also not appreciated some of the powerful traditions we have already created that have brought us memories of connection and laughter. Every PCS, we celebrate our first night in a new home with Chinese takeout. We’ve replaced birthday parties with a family day where we celebrate that individual for an entire day. And, lately, brave days at a new school are celebrated with frozen yogurt and conversations about courage. Perhaps part of growing up is the reminder that we must choose to embrace difficulty with creativity rather than resentment. There are some traditions that I will continue to grieve as they may not be possible for our military family. Yet, in their place is the opportunity to decide for ourselves who we are and what is most important to us. This can be exciting and full of new adventures if I allow it. And even more rewarding? The knowledge that someday I will pass down to my own children the truth that traditions are more about the people they bring together than anything else.